The Tupolev Tu-160 'Blackjack' is a supersonic intercontinental bomber designed during the Cold War to carry and launch Air Launched Cruise Missiles (ALCM). The Tu-160 is the heaviest and most powerful combat aircraft in the world today. The aircraft is capable of a maximum speed of Mach 2.05 or 2200 km/h (1367 mph) and has a maximum range of 13950 km (7,533 nm). The aircraft has a slender long blended wing-body design with a variable-geometry wing. The four NK-32 afterburning turbofans are arranged in pairs under the mid-wing each with variable-area intakes. The undercarriage consists of one front double-wheel leg and two six-wheel bogies (three tandem pairs), which are located between the engine pairs. Along the aircraft's centreline between the two gear units there are two weapon bays, which are divided by the wing carry-through structure. The variable-geometry wing has three positions. 20 degree sweep for landing, 35 degree for cruise and 65 degree sweep for high speed flight. The inner portion of the wing forms a vertical plane for directional stability when the wings are fully swept backwards. When the wing is swept forwards this portion lies flat to fill the gap between wing and fuselage and forms the most inner part of the flap. The nose of the aircraft contains the Obzor-K (Survey) radar, which is used for both ground and air observation. It also contains another radar, the Sopka (Hill), which is used for terrain following when flying at low altitude. The upper center part in front of the windscreen contains the retractable inflight refuelling probe. Under the front fuselage there is a forward looking OPB-15T optical bombing sight and video. Behind the sight, there is the nose gear. The four man crew enters the cabin through the front gear bay. The pressurized cabin has four fighterjet-like K-36LM ejection seats. There are two control sticks for commander pilot (front left) and co-pilot (front right). The Tu-160 has a conventional flight deck, which is divided by a central console with the thrust and flap selection levers for the co-pilot. Behind the pilots there is the navigator/offensive weapons operator (left) and the navigator/electronic warfare and communications operator (right). Behind the crew there is corridor leading to a galley and a toilet. 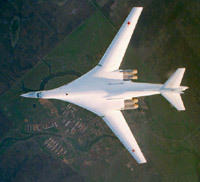 The Tu-160 houses a Baykal self-defence systems of which most systems are located in the 'carrot' tail cone. These systems include a Mak (Poppy) infra-red missile launch sensor, radar warning receiver, electronic jammer and a battery of APP-50 chaff/flare dispensers. The underside of the tailcone houses the brake chutes. Directional control is provided by an all moving fin. The weapons carried in the weapon bays comprises of six (or a maximum of 12) Raduga Kh-55SM (NATO AS-15B 'Kent') cruise missiles, which are launched from two six-round MKU6-5U revolving launchers located in the forward area of each bay. The nuclear warhead loaded Kh-55SM is a development of the subsonic Kh-55 cruise missile. For guidance of the Kh-55SM the Tu-160 is equipped with the Sprut-SM (Octopus) navigation/attack system, which automatically aligns the coordination axes of both aircraft and weapons. It also generates a digital map of the terrain which is transferred from the aircraft to the missile before launch. Alternatively the Tu-160 can be equipped with up to 24 Raduga Kh-15 (NATO AS-16 'Kickback') short-range attack missiles (SRAM) or Kh-15P anti radiation missiles, which are both launched from up to four MKU6-1U revolving drums. However reportedly the Kh-15 capability has not been implemented on any production aircraft. Although there are some differences between the first prototype, the development and the production aircraft, only one variant of the Tu-160 entered production. NATO codename for this variant is 'Blackjack-A'. The Russian Air Force is planning a limited upgrade for the Tu-160 fleet. First stage of the upgrade will equip the aircraft with the conventional armed Kh-101 and Kh-555 cruise missiles and a new fire control system for these missiles, called Sigma. 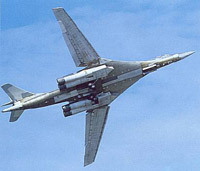 The Kh-101 uses a electro-optical terminal homing system and the Tu-160 will be able to carry up to 12 of these missiles. The Kh-555 is a reworked Kh-55SM with uses the Kh-101 homing system and replaces the nuclear warhead with a conventional one. Second stage of the upgrade will include upgraded mission equipment and a new search-attack radar. Besides the Kh-101, this will enable the Tu-160 to be equipped with the Kh-102 strategic missile, medium range subsonic Kh-SD and a medium range supersonic weapon, presumable designated the Kh-41. Other upgraded system include navigation, communication and self-defence systems. The upgrade will be carried out by KAPO at Kazan and will extend the service life of the Tu-160 until at least 2020-2025. Donald, D. (ed. ), (2003). Tupolev Bombers, pp. 126-157, AIRtime Publishing Inc., USA.